The ‘very short introduction’ series from OUP is decidedly variable in its content. Some are really readable pocket popular science books. This one isn’t. 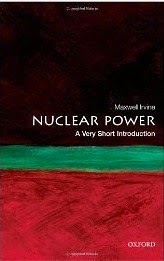 However I would say it is an absolutely essential little book for anyone who wants to get the facts straight in a discussion of the pros and cons of nuclear power. In effect it’s a fact book on nuclear. And being a collection of facts it isn’t always incredibly readable (not helped by the industry’s delight in acronyms). The pages on different reactor types in various countries, for example, provide little more than a long, detailed list. Yet it’s all valuable information. The way, for example, in the UK pretty well every reactor is a prototype, so we never got the benefits of scale that France did from mass production. The book is modern enough to cover the 2011 Japan tsunami disaster and its impact on the power plants, though doesn’t mention the painful knee-jerk political reaction in countries like Germany. It is clear and factual on costs (remarkably similar to coal/oil when everything is factored in, though longer term hence the investment problems), on risk and on the world’s need to have conventional nuclear to keep us going until fusion comes online (which it explains very well).With the best will in the world, that isn’t going to be until the 2050s at the earliest. It doesn’t dismiss renewables, but highlights the way they just aren’t and can’t be enough to get us into cleaner energy soon enough. Overall then, in terms of value of content, this is probably a five star book, but I can only give it three stars because it’s not much of a read.